BECAUSE I FISH mostly in the Northeast — where over the course of a season nymphs and streamers surely catch more large fish than dry flies do — I am loath to fish anything but surface patterns when I’m out West. 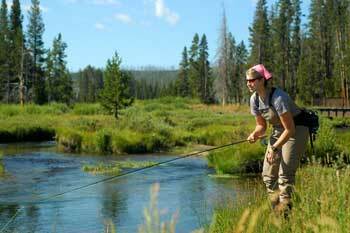 Don’t get me wrong: I’m no dry-flies-upstream-only purist. It’s just that the chance to cast hoppers or PMDs to large, sipping trout in a high-meadow stream is what brings us to the Rockies in the first place, right? So one afternoon in early September when Larry, Jim, and I approached the Encampment River — a tributary of the North Fork of the Platte in southern Wyoming — I had no intention of tying on anything but a dry fly. We’d had a lot for high water back home during the summer, and I was looking forward to easy wading and upward-looking trout. Because of the long drought, the stream was fairly small, never more than 30 feet across in the shallowest parts, and as we approached the bank I saw a promising rise in the pool just above where the path met the water. Since we had only about a half-mile of river to work with, we separated it into three beats. I took the middle stretch, while Larry went up and Jim headed downstream. After about an hour and a half of casting every dry fly I could think of that was appropriate for the season — Dave’s Hopper, Turck’s Tarantula, Elk-Hair Caddis, Cinnamon Ant, Blue-winged Olive Comparadun, Trico Spinner, and more — I hadn’t even gotten a strike. Hell, I hadn’t even spooked a fish. I tried adding a Pheasant Tail Nymph as a dropper. Nothing. How about a Flashback Hare’s Ear? Same result. I was standing in the water staring blankly into my fly box when Larry wandered down from his upstream beat. “This is great, huh?” he called from the opposite shore. Larry pointed upstream with his fly rod. This is just the kind of question that causes a fly fisherman’s ego to shrivel like an overripe banana, but luckily Jim appeared from downstream at that moment to explain that he had struck out, as well. We both turned to Larry to ask the obvious question. “Streamer,” he said matter-of-factly, holding up the aptly named North Fork Special attached to his tippet. For the rest of the afternoon, during which I caught several nice trout on the North Fork Special that Larry had given me, I pondered the ease with which one can become set in his fly-fishing ways. Many of us consider fishing a streamer only under a limited number of fairly specific conditions — early or late in the season, or when the water is especially high or off-color, for instance. One reason for this mindset, of course, is that we relish the opportunity to fish the delicate stuff. Fishing a dry fly or a nymph, we believe, tests our skills more fully through the need for accurate casting, good line management, and the ability to achieve a dead drift. All you need to do to fish a streamer is cast quartering downstream and let it swing through the current. You don’t even have to strip the fly if you don’t want to. But of course, that’s not true. More than anything else, I think, it is this impoverished view of streamer fishing that keeps anglers from tying one on in a wider range of angling situations. Actually, there are many different ways to fish a streamer — some of which call for the same skills required by nymph fishing — and a Woolly Bugger or Black-Nose Dace can be productive in many different kinds of water. By thinking of your big, meaty patterns as versatile weapons in your fly-fishing arsenal — rather than as last-chance options — you’ll put yourself in position to catch more big fish. Let’s examine a few streamer-fishing methods that go beyond the simple strip-and-swing technique. The fact is, you can fish a streamer in most any situation — including during a hatch. Just because you can fish a dry fly doesn’t mean youshould. 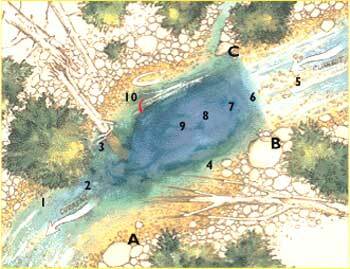 This diagram of a pool on the Encampment River shows the various ways you can fish a streamer to cover all kinds of water. Approaching from downstream, start from Position A and “bang the bank” on the other side by casting to spots 1, 2, and 3, furiously stripping the fly away from the bank. Then cover the flat “frog water” inside the bend by casting to 4 and stripping the fly back. If you spot a large fish holding in this spot, try letting the fly sink slowly while you twitch it. Next, move to Position B and cast upstream into the fast riffle (5). Dead-drift the fly over the lip and into the pool itself. To work the pool’s inside seam, cast to 6 and allow the fly to swing. Lengthen your casts (7, 8, and 9) to cover the entire seam. Wade across, well upstream of the pool, to position C and swing your fly into the outside seam by casting to the same positions (6 through 9). Finally, cast into the smaller eddy (10) and allow your streamer to sweep along the edge of the downed tree. The standard wet-fly swing can be adapted to fit any number of angling situations, and you can control both the direction and the speed of the streamer to trigger more strikes. Rather than simply executing the same quartering-downstream cast over and over again — like an Atlantic salmon fisherman trying to cover every inch of a pool — try to guide the fly to specific lies, so that the end of the swing occurs right in front of the trout’s nose (if there is, in fact, a trout there). Pick your spots by allowing the fly to dead-drift into position before you allow it to swing, and then control the motion of the fly by adding mending, slack, or tightening the line during the swing. With a little bit of practice, you’ll be able to swing a fly into very tight spots. I like to use a streamer to work the same scum lines and current seams that I would target with a dry fly or nymph. To work the seam between fast water and an eddy, for instance, cast the fly into the fast water and then swing it into the seam itself. Make a few strips right up through the edge of the slower water, and then try lengthening your casts to cover the entire seam. Vary the speed of your retrieve with each cast. Because streamer fishing is a less-than-exact science, I change my position frequently so that the fly moves into a possible trout lie in several different ways. For instance, once you’ve swung a fly into a seam line for a while, reposition so that the fly swings through the seam and into the slow water. Then try swinging from the slow water into the fast water. The possibilities are limited only by the availability of places to stand. Each time you change position, you alter the presentation slightly — its speed, angle, or the profile of the fly — and oftentimes this is all it takes to draw a strike. One of the few popular “non-swinging” streamer tactics is dead-drifting a streamer along a bank so that its profile is perpendicular to current. This strategy works great wherever there is very roily water or a sharp drop-off, as well. On Encampment Creek, there was a spot where a fast, shallow riffle dropped off sharply into a deep, slow pool, and I took a nice brown trout by dead drifting a streamer over the lip as if it were an injured baitfish floating down from the pool above (see illustration). The fish was lurking just below the lip, and it took as the fly began sinking to the bottom of the pool. When you are dead-drifting a streamer, use your line to control the fly, as you would when fishing a nymph. A high-sticking technique works great when you want to float the streamer along a cut bank or through a deep slot between two boulders. The advantage of a streamer in these situations is that the take is not subtle. When a trout attacks a baitfish, it almost always does so aggressively — no strike indicator necessary. Using a streamer to imitate a stunned baitfish that has just been washed over a waterfall or through the turbines of a dam is among the simplest fly-fishing presentations. All you have to do is cast the streamer into the boiling water at the base of the waterfall or dam, give the fly enough slack that it can be bounced around by the wild and competing currents, and then hold on. The trout have figured out that the trip over the falls or through the dam’s turbine’s leaves the baitfish injured or just temporarily paralyzed, which makes for easy pickings. Don’t worry about missing the strike; the fish usually takes up all that slack in the first seconds of the fight. I’ve had great success with this lazy-man’s strategy at Middle Dam on Maine’s Rapid River and at the Fife Brook Dam on the Deerfield in Massachusetts. Fly fishermen are taught that trout live in moving water, and we have disparaging terms such as “frog water” to describe those places where you can’t get a decent drift. But there are often big trout in them thar slow, flat sections and eddies, and a streamer is the tool you should use to find them. When faced with a large eddy or slough next to the main current, your best bet is to start at the downstream end, cast your streamer close to the bank, and strip the fly quickly against the eddy’s reverse current. Oftentimes, trout will hold just on the slow-water side of the current seam. Their main source of food is the current rushing by, but they will dart into the eddy whenever they see a big morsel going by. Particularly big fish often have less fear of predators, and they will hold in the bottom of the eddy itself. Because these monsters have staked out a prime territory in which they don’t even have to fight the current, they are often quite lazy, refusing to chase anything. Why should they? The eddy is little more than a slow lazy Susan full of food. If you spot a big trout in an eddy, tie on a streamer pattern that contains lost of marabou and cast to a spot where the slow eddy currents will deliver the fly to the fish. 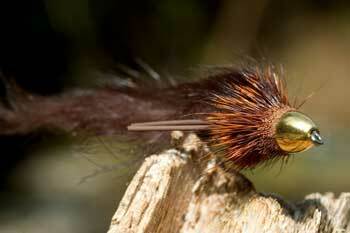 Don’t strip the fly; instead, as it sinks, twitch it with short pulls on the line. The lifelike waving of the marabou and the seemingly injured, struggling motion of the streamer can be irresistible to a trout looking for an easy meal. One of the more exciting — and, frankly, exhausting — ways to fish a streamer is to “bang the banks,” which involves casting a bulky fly right to the water’s edge, and then making four or five hard, fast strips. There’s no need to strip the fly all the way back; if a fish is going to strike, it will do so by the fifth strip. So cast, make your five strips, pick up, and then cast again. In the course of a day, you may make a thousand such casts, which can leave you with a sore shoulder and a blistered stripping finger, but the savage strikes make it all worthwhile. Because the streamer imitates a fleeing baitfish, the trout jump on it right away, so it doesn’t escape. When the fish hits, you’ll feel the line simply stop in your hand. 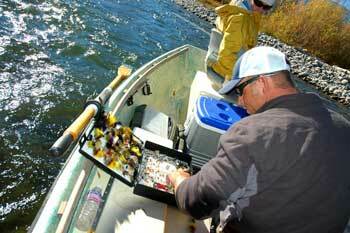 Give a sharp strip-set, and then raise the rod to keep the fish from ducking back under any streamside snags. This works great in during spring runoff or any time there’s high water, when the trout are clustered against the bank to escape the surging current. You can bang the bank on any stream, although it’s especially effective when you are casting from a drifting boat. Next time you’re on the water and your first-choice strategy isn’t working, consider tying on a streamer and fishing it in an unconventional way. Sure, you won’t be able to imitate the “shadow casting” scene from The Movie, but you’ll probably catch more fish.